Wow, Elvis looks so young here. He’s just turned twenty but could be five years younger. Not yet had a hit single. Still slightly uncomfortable with the attention. The others look so old in the way that pre-rock’n’roll artists did. 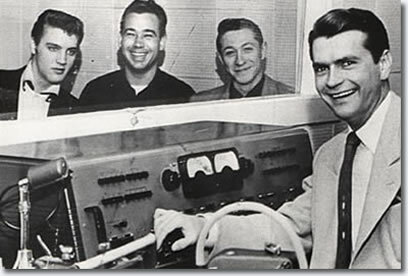 His band Bill Black (second from left) and Scotty Moore were actually 29 and 24 respectively & Sam Phillips (on extreme right, with the smile of the cat that got the cream) was only 32.